The NF1 basketball regular season has finally come to an end after 30 rounds of matches. The fight for the last place in the NF1 final four went to Toulouse. At the bottom of the table US Laveyron became the final team to finish in the relegation zone after losing to Armentières. Limoges ABC won the regular season last weekend and made it a point of honour as they won on the road (60-51) against Ifs. Armentières finish in second place after beating US Laveyron (90-68) at home. Illkirch-Graffenstaden dropped to third place after losing on the road (62-90) against Charleville-Mézières. However this victory did not help Charleville-Mézières reach the final four because Toulouse beat Voiron (81-41). Toulouse go to the NF1 final four because of their better aggregate score than Charleville-Mézières. 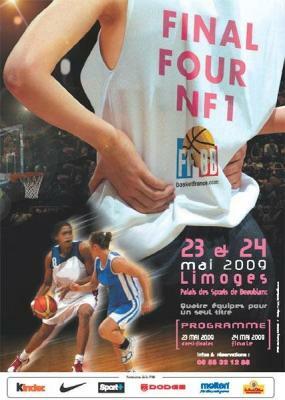 The NF1 final four will be held in Limoges from Saturday 24 May until Sunday 25 May 2009. The semi-final matches will be played on Saturday with the 3rd place match and final played on Sunday. Pleyber-Christ has become last-game specialists when looking for a reprieve from avoiding relegation. Last season they beat Dunkerque on the last game of the season, a victory that allowed them to stay in NF1 despite finishing in 14th place. For the first time this season the hall of Pleyber-Christ was empty. Melanie Vernier from Pleyber-Christ had one of those games when everything went in. She scored 30 points and went 5-of-5 from beyond the arc as Pleyber-Christ beat US Colomiers (91-74). A victory that moves Pleyber-Christ up to 14th place while Colomiers drop to 15th place. It was a sad night for Bronislava Soltisova from Pleyber-Christ who appeared to have hurt left knee after going up for a lay-up during the third quarter. Two seasons ago (2006-2007) Ifs dropped out of NF1 despite finishing in the upper half of the table but made a quick return. It was announced before their game against Limoges that they will not be excepting a reprieve from the Federation and will drop to NF2 next season. US Laveyron finished the season in 12th place and occupy the first spot in the relegation zone. They lost out to Voiron on point average as they finished the season with identical records. The French Basketball Federation (FFBB) will make an official announcement some time which clubs in the relegation zone will join Ifs in NF2 next season. The first surprise of the weekend was the CFBB roster for the last game of the season against Rennes. Most of the regular players from the NF1 roster were absent and replaced by the 1993 generation players who were playing in NF2. Jodie Cornelie (above) from the CFBB took on Rennes single-handedly for the first 13 minutes of the game as she scored all 14 points for her team as they trailed (14-18). Frédérique Prudhomme, the coach from Rennes, then called on Nadja Morgan and Yvettes Assilamehou to put an end to the CFBB charges. Rennes quickly took control and went into the interval leading (33-19) and had no more problems for the rest of the game to win comfortably (78-58). Nice ended the season on a positive note by beating Dunkerque (83-64) while Roche Vendée required overtime to beat Strasbourg ABC (83-77). Nice COB (NF1) are likely to merge with Nice CAB (NF2) and form a new club for next season while Strasbourg ABC are hoping to secure funding for next season.